Disappointment... we all face them. A promised PCS to a base close to 'home' changed at the last minute to clear across the country. R&R or Homecoming pushed back days or even weeks. A savings account depleted to pay for unexpected household expenses. The question is how do you handle them? When we were all done "talking" we found something we could do together. I admit after a very busy week I was looking forward to putting my feet up and enjoying a good book on our deck, but sometimes the role of ____________ (fill in the blank; ie mom, friend, spouse) superseded self. sometimes. I knew a local church was throwing a small festival to raise money for their school this weekend; so that became our evening plans! What a great way to spend some one on one time with my *C*. We bought funnel cake, cotton candy and rode some carnival rides. 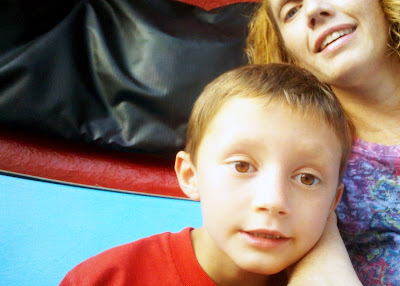 We laughed together, smiled together, screamed like crazy together (on a small carnival-ride of course). Disappointment was out the window and a little time with our mind on the time in front of us made for a perfect Friday evening! Mother and son getting ready to enjoy the carnival's "spin ride". How do you handle disappointment? It is a great feeling to help someone through it and take the time to enjoy a bit of 'silver lining'. it does sometime stink when the military throws us for unexpected loops.. but I can honestly say no matter what somehow we military spouses have found a way to think of the best and find a way to come out even better then before. My husband has been through more then his share of deployments and now we are in Fort Irwin, Ca... and it was not even a choice we wanted .. but we are here and he is not going to get deployed.. We might be broke from the expense of moving but once again we are together for a change .. and that means more then the PCS station of our choice ..
Love it Gina! My folks had orders to Andrews AFB way back in the early 70s. They would have been close to my mom's folks (well within a few hours) it was exactly what they wanted. They had packed out, household goods were on the way to Andrews and wham ... diverted to Indian Springs, Nevada. Death Valley. At least an hours drive from anything. They made the best of friends, great start to his 30-year Air Force career and they had me! :) You just never know how your cards are going to play out.